Get artsy and crafty with Make & Craft Magazine. Currently, this magazine is offering a free drawer for any subscriptions based in the UK. This is a valuable gift that customers wouldn’t want to miss. With every 24 months magazine subscription, customers would be entitled to one of this fabulous drawer that is worth £35! Read on to find out more about this special offer! 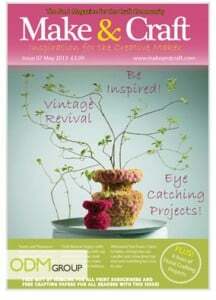 Make & Craft magazine is a creative hub for craft lovers! This magazine is packed with inspirational, creative and exciting craft ideas. Besides that, it offers the latest updates on crafting products and supplies. Some of the things that readers can expect to find are things like new craft techniques and sneak peeks behind the scenes of artists and crafter No doubt that this magazine is definitely a very insightful crafting source of inspirations! Choose a relevant gift with subscription! Make & Craft has made a wise choice on selecting a very relevant gift with subscription. Relevant here means that the choice of gift has the ability to relate to their company products and services. And this also allows customers to easily link it back to Make & Craft. Let’s take a closer look at this gift with subscription. 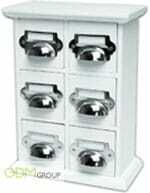 This is a gorgeous set of six white drawers with metal cup handles. Besides its high ornamental value, this gift is definitely useful and practical. It is an ideal storage to store bits and bobs and crafty supplies. Alternatively, it is suitable to store kitchen herbs as well! Here we can see that, Make & Craft had their customers in mind while choosing this relevant gift. As they understand that their readers are mostly artist and crafter offering a drawer set like this is definitely something that would entice them to subscribe. Reason being of its lovely exterior and long product life! Tips on gift with subscription! Therefore, companies should always have their customers in mind while choosing for a suitable promotional gift. Look at the content of the product and relate it to your target audience. This allows you to maximize the money you spent on your promotional products.